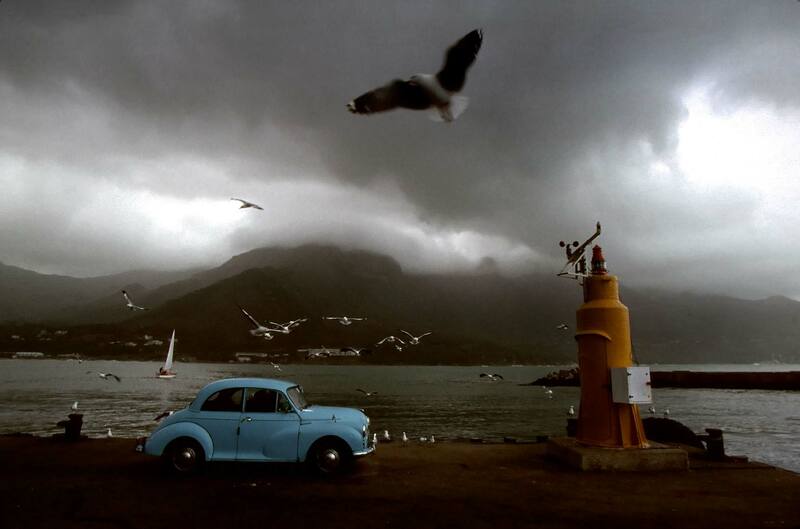 Storm clouds send the sails and seagulls ashore along False Bay. "I saw Table Rock anyway -- a majestic pile... and I saw Table Bay, so named for its levelness. I saw the Castle -- built by the Dutch East India Company three hundred years ago -- where the Commanding General lives; I saw St. Simon's Bay, where the Admiral lives. I saw and explored the beautiful sea-girt drives that wind about the mountains and through the paradise where the villas are. Also I saw some of the fine old Dutch mansions, pleasant homes of the early times, pleasant homes today, and enjoyed their hospitalities."